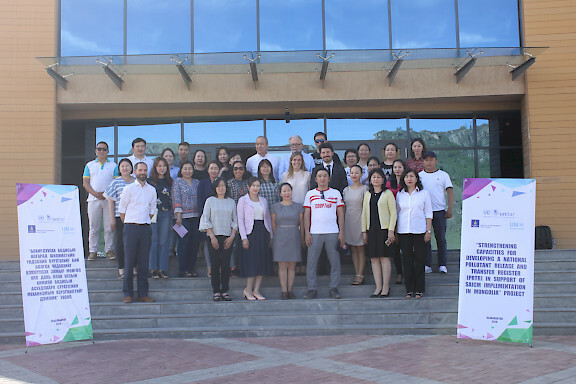 The National Inception Workshop for the project “Strengthening Capacities for Developing National Pollutant Release and Transfer Register (PRTR) in Support of SAICM Implementation in Mongolia” was organized jointly by UNITAR and the Ministry of Environment and Tourism of Mongolia (MET), the 27th June 2018 in Ulaanbaatar. The meeting took place in the offices off the MET. This project aims to build national knowledge on PRTR, designing the key components of the system and run a pilot test. Four components are included: knowledge-building on PRTR, design of the national PRTR system, pilot testing and awareness raising. The objective of the meeting was to officially launch the project in front of the Project Steering Committee, as well as to present the project, the steps and the challenges regarding the design of a PRTR system in Mongolia. Engaging the assembly to work together was one of the outcome. Besides the National Inception Workshop, a two-days training workshop took place in the premise of the Red Rock Resort. The objective of the training was to introduce the participants on different aspects of PRTRs, namely technical and institutional features. Members of the steering committee, as well as other government, industrial and NGOs representative attended it. The training was conducted by Mr. Redzic from the Serbian Environement Protection Agency, Representative from the US EPA and Climate Change Canada, and UNITAR representatives.